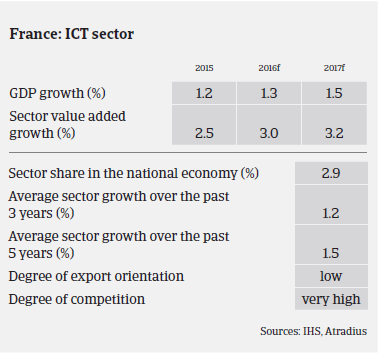 The French ICT sector has been rebounding since the massive contraction in 2009. According to French research institute Xerfi, sales in the French IT segment (computers, tablets and smartphones) increased to 30.9 million units in 2015 (2014: 29.1 million units) and are forecast to rise to 32.4 million units (up 4.9%) in 2016. However, within this segment, sales of computers and smartphones continued to grow in 2015, while those for tablets recorded a decrease of 11.3%, mainly due to market saturation and competition from laptops and hybrid products. The French IT services sector (technology consulting, software and services) grew 2.1% in 2015, to EUR 50.5 billion, and an increase of 2.3% is expected in 2016. It is expected that IT services will be the main driver of ICT market growth in the future due to the expansion of cloud computing, and the need for higher mobility – now a must-have for many French businesses, driving up demand for servers and IT consulting . SMACs (Social, Mobile and Analytics in the Cloud) and SaaS (Software as a Service) technologies are expected to record further high sales increases in 2016. Despite overall growth, many French ICT companies suffer from structurally low margins, with equity ratios often not exceeding 15%. French players usually post lower operating margins, as they are more dependent on the domestic market, while their international competitors have a bigger presence in more dynamic ICT growth regions. The French ICT market environment is highly competitive, while at the same time prices in IT services have remained rather stable since 2005 (as a result of fixed-price contracts). Given the highly competitive environment, price pressure and the on-going consolidation process in the market, many smaller ICT players face difficulties due to the potentially one-sided concentration of their customer portfolio and limited value added. Many IT hardware wholesalers try to move away from pure hardware selling to offer more added value products and IT services in order to improve their profitability, as this offers higher revenues and better margins. 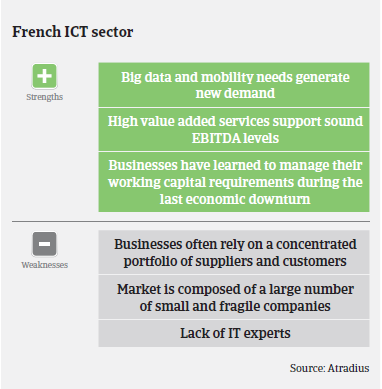 Despite lower margins and weaker structures, French ICT players are rather resilient due to flexible cost structures. We expect payment delays to remain low and generally stable in the coming months, as the cash reserves of many ICT businesses are satisfactory. ICT insolvencies decreased 9.5% in the period January-September 2015, and the insolvency level is expected to remain low in 2016. However, sudden business failures, even of larger players, cannot be ruled out due to the challenging market conditions. Our underwriting position in the ICT segment remains generally open. 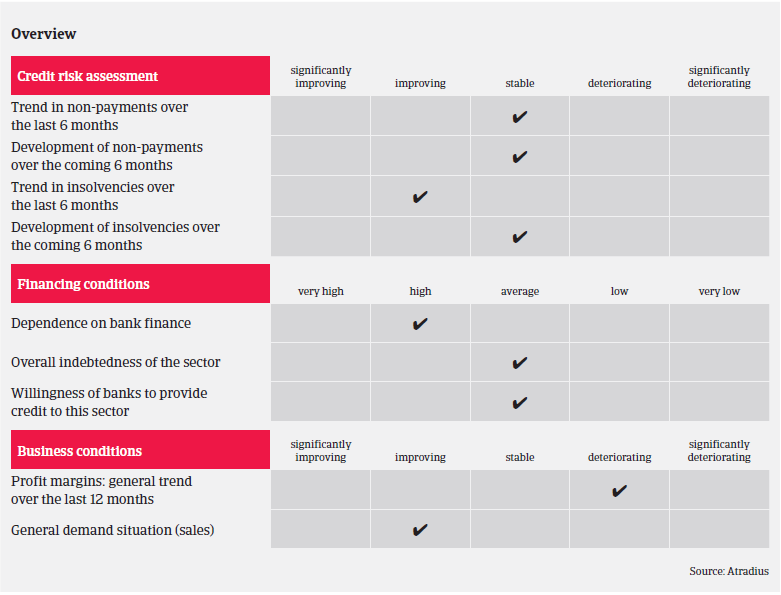 However, we have to take into account that the risks, especially for smaller ICT businesses, are still high: with limited equity bases they will struggle to absorb any further decline in margins in a market that is highly competitive and which requires ICT wholesalers to provide additional services. When underwriting the ICT sector, we take into account the turnover breakdown between hardware and services and the type of ICT products. We also pay attention to the customer and suppliers structure and examine working capital requirements and financing.